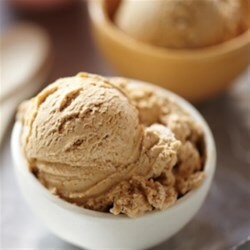 "Pumpkin, cinnamon, and ginger flavor a rich homemade ice cream that gets extra crunch and flavor from crushed gingersnaps." Beat heavy whipping cream, vanilla extract, cinnamon and ginger in large bowl on medium speed with electric mixer until stiff peaks form. Combine pumpkin and sweetened condensed milk. Fold in pumpkin mixture and gingersnap cookies into whipped cream mixture. Pour into 9 x 5-inch loaf pan or other 2-quart container; cover. Freeze 6 hours or until firm. Cool off with quick-and-easy homemade ice cream—no ice cream maker required! Love the flavor. Not too sweet. It is more like a frozen mousse. Not a bad thing. But different. Light and easy to make. I just whisked all of the ingredients then froze it in an ice cream machine. It tastes very similar to pumpkin pie filling. Great! Made recipe as directed except finely crushing cookie s and adding a bit more sugar. Huge hit for my foodie friends.